Five years ago, the rise of original ratings for cable series was really something to behold. For many shows, the growth felt endless, and the top cable shows became more and more competitive with the broadcast big guns. Judging some of these series compared to the typical rate of decline on broadcast seemed unfair to broadcast; cable was a healthier environment because it was poaching viewers from broadcast. I was never that into the whole broadcast vs. cable narrative, in which people would cherry-pick timeslots where cable successes would outrate broadcast failures. But it was happening a fair amount, and that narrative helped illustrate to the casual follower what a different world it was becoming. But you don't see that kind of narrative trotted out as much these days. Shows like The Walking Dead and Game of Thrones remain enormous anomalies, but for the shows in the trenches, there is an increasing amount of ugliness that hasn't really gotten reported. Occasionally, someone in the media will remark on an individual network, that USA's dramas are struggling or that FX's live ratings are going in the tank. But as someone who tracks a fairly large volume of this stuff (if still miles from all of it), I have gotten the sense it's happening to almost everybody. Huge year-to-year declines are all over the cable original map. So before moving forward with commentary on individual cable shows, I wanted to do a more formal look at the bigger picture. Here are the Live+SD A18-49 year-to-year trends for the 44 returning scripted cable series in my records for the 2014-15 season. This list mostly starts with fall 2014, though there are a few late summer 2014 series as well. Compared with broadcast, this is pretty rough. Only five of the 44 are up in raw numbers (and two of those are the same show, the half-seasons of The Walking Dead). Just five more are even down less than the big four networks' "league average" decline of -10.7%. 25 of the 44 shows are down at least 20%, and over a third of them are down more than 30%! 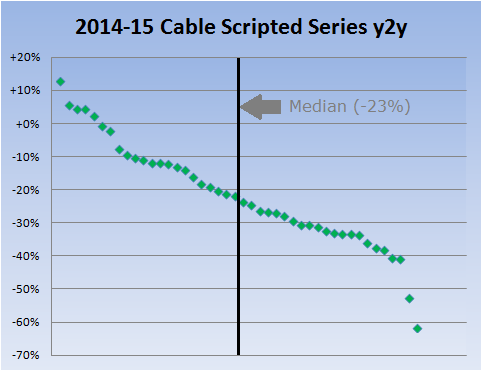 The median Live+SD trend among cable returnees is a sobering -23%, meaning half the shows are doing even worse. This number is "just" -12% for returning shows on the big four networks. On broadcast, the huge decliners are far rarer; only about 15% of returnees dropped more than 30%. Perhaps some of this is just about individual shows; cable development hasn't been as great in recent years, with no truly huge anomalies since The Walking Dead and Game of Thrones a half-decade ago. But 44 shows is enough of a volume with such starkly different behavior to say there could be some larger trend here. My theory? "Once a cheater, always a cheater." The same behavior that once boosted cable is now working against it. The rise of cable was built on an audience fickle/mobile enough to seek out alternatives beyond the traditional broadcasters. And the rise of DVRing, cord-cutting and streaming services has been built on the same kind of people. Those alternatives are taking more audience away from the cable crowd, which has already proven fickle/mobile. And the more traditional broadcast audience is now more resilient by comparison (if still not that resilient in an absolute sense). Maybe this is mostly about just DVRing later, or maybe they're bailing on the medium entirely in favor of Netflix/Hulu/etc. Someone with more access to cable Live+7 stuff could investigate my particular theory further. Rather than pinpoint where they're going, for our purposes the important takeaway is that it seems they're going somewhere, and at a markedly quicker rate than on broadcast. Though this bears continued monitoring, there are enough shows here to say that using the broadcast decline standard still feels unfair... but now it's unfair to cable. If I used the usual broadcast criteria, it would be a rather ridiculous grade distribution. Usually for broadcasters I consider a league average decline (-10.7% in 2014-15) to be about a B-. If that standard were applied to cable, only ten of the 44 above series would be above that -10.7% line. Cable's median -23% decline would represent about a D+, meaning half the series would be a D+ at best, and most of that half would be worse! If F grades start going out at around a one-third decline (-33%), over a quarter of the series would be below that threshold. This is all mostly just a long way of saying that I will try to adjust for this somewhat when doing the grading for this summer's War of 18-49 cable updates, starting tomorrow. I'll usually be close to a full letter grade more lenient with cable grades, with that B- threshold falling much closer to -20% rather than -11%.